First off, I should mention that although I like the original Carcassonne, I don’t love it. I love memory games, and I love strategy games, but my feeble brain isn’t capable of remembering every tile possibility in the game, and then extrapolating what is already on the board. Kudos to those that can, but I don’t count myself among the worthy. This game slightly removes that element – the choices of where to put your meeples strategically is removed. No longer will you leave a meeple stranded to spend the rest of his / her days toiling in an unfinished field. That sets my mind at ease for reasons I cannot describe. You draw a random tile, and then place it legally. I don’t know the specifics, but it feels MUCH easier to place a tile legally then it is in the original game, so I suspect only roads and ends of roads exist on the four sides. The only goal in this game is to finish roads, and after the road is finished, you place your meeple(s) on it to remind everyone how cool you are. The first to run out of meeples wins the game. Simple, elegant, lovely. Because everyone’s meeples are on display, it is possible to tell when someone is closer to winning than you and not go out of your way to end the game, because it has likely been less than 10 minutes. The components are beautiful – nice, thick, and large tiles (larger than original), and oversized meeples. I sincerely hope the re-printed edition of this maintains this. Final thoughts – lovely, short, simple. Great to teach game mechanics to anyone, but that tiny bit of strategy to keep us adults engaged. Overall the components are good, you get 36 thick cardboard tiles, each tile has road connections printed on each edge, with pictures of children wearing the players colors on the roads. There are also 32 wooden people, eight in each color (red, blue, green, yellow). The only problem i noticed with the people is some of the feet were chipped so they would not stand up, not a problem really. You start with 8 wooden people and your goal is to place them all on completed roads, the first to do this is the winner. 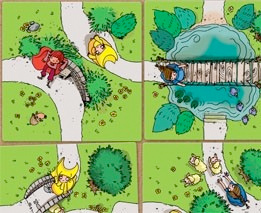 Each turn the current player draws a random tile and connects it to an existing road thats on the table, if this completes a road (closing it from end to end) all players that have a child of their playing color on the road can put their wooden pieces on the board. Each turn is quick enough that the youngest kids don’t loose interest while waiting for their turn, the only choice you can make in the game is where and what orientation you place your road tile. The game is great for the 3-5 year old audience, its a easy game that plays fast. As the board games hobby becomes increasingly popular, the demand for games that are accommodate the youngest audience grows. It is no surprise that a modern classic like Carcassonne would be among the first to receive this treatment. How does this simplified version stack up against its cherished predecessor? Let’s chase after that chicken for a while! My First Carcassonne (previously known as Kids of Carcassonne) is intended for players as young as 4. It uses large, chunky tiles that only have one element on it – roads. Some tiles have termination points on them – a road going into a building or towards a courtyard. When a road “terminates” at both ends it is considered to be finished. Most road segments will have a little kid figure on them, belonging to one of the four players’ colours. When a road is finished – players may put one of their seven large chunky meeples on that tile. Whoever gets rid of all their meeples first is the winner. The components are nice and big and unlikely to be misplaced by mischievous younglings. The tiles are chunky and don’t slide around easily as kids try shuffle them around trying to find best placement. It is a robustly crafted game that caters to its audience. The art, cartoony in style, is somewhat busy and far from the quaint greens of the base Carcassonne, but the bright colours and the fun scenarios of kids chasing after goats and chickens adds to the game. The game accommodates 2-4 players with an expected age of 4. My son started playing it when he was three and had a great time with it. Because the only element on the tiles are roads – all tiles are compatible and there is no “wrong” way to put a tile, minimizing frustration. The rules are also simple to grasp, though developing an effective approach might take the smallest kids some time as they grasp it. Great thing is that the process of figuring it out (hopefully with some gentle adult guidance) is not frustrating as it’s a good engaging time regardless of whether the kid is winning (clearly, mileage will vary depending on kids’ temperament). The decisions are bite-sized and because there are no wrong ways to play a card – the wait time is easy. The game goes 10-20 minutes and adult supervision are required only if players are 3-4, with older kids able to play by themselves. Will my kid like it? Will I? We had a great time with My First Carcassonne and it is one of the staples in our collection. It is not a particularly engaging game for adults but the fun of playing together more than compensates for it. The games can drag a bit, especially with more players, resulting in loss of patience for younger kids. If you know that the attention span is a concern – I suggest playing with a few less meeples to start. I can’t say how well the game plays with older kids but I imagine it would be too simple for them to enjoy (though “supervising” a group of younger kids might be a fun responsibility!). The game teaches spatial reasoning, with deciding how to place a tile so that it connects to roads where your existing figures are or so that the game is closed. Some minor math is involved as you count number of figures of each colour on a closed road or a number of remaining meeples. My First Carcassonne is a really simple game that teaches key core concepts of taking turns, winning and losing. It also provides necessary life lesson of what a meeple is. While it won’t blow your or your kid’s mind – it is an approachable stepping stone to get your kid comfortable with games as an activity, paving the way for the more advanced fare in the future. If you enjoyed this review please consider visiting the Altema Games website for more neat board game materials. Kids of Carcassonne does a really nice job of simplifying the game based on it’s namesake for young kids. I bought this for my youngest daughter who turned five not too long ago. We pretty much all enjoying playing a round or two, especially to help satiate my daughters need to play, since you can’t play the more grown up games with the rest of us. Tiles are nice and thick, so you don’t have to worry about them getting messed up by the little hands. The artwork is cute and playful which appeals to the little ones. The figures are sturdy wood and well painted just like regular Carcassonne, but a little bigger in this version. Each player first chooses their color between yellow, blue, red, or green to play. They then take turns putting tiles down and connecting them just like Carcassonne. However, the tiles will always connect, no matter how you put them down, so it makes it easy for the little ones. The goal of the game is to complete the roads with child on the road that has your color to score points. You show you scored by putting your little figures over the children on the completed road of the same color. The first one to use up their figures wins the game. If there is a tie, then tied players both win. I was surprised how fun this game can be for how simple it is. In some ways, I find it more refreshing than regular Carcassonne, and that’s probably because there is less hosing over your opponents in the kid version. It is definitely well designed for younger kids, because there is very little counting and helps them with color identification. This makes a really good family game for mamas and papas with their little ones. Add a Review for "The Kids of Carcassonne"